This piece of Brickercup vs Brickubbles fan art, which is part of BrickercupMasterX3’s PPG OT3 Month, is dedicated to Ria Marie aka riamarie33 who is celebrating her birthday today. So, Ria Marie, I wish you a most blessed, awesome, beautiful, great, and prosperous birthday. I wish you a lot of love, joy, happiness, and abundance in your life as an artist and as a person. This is also dedicated to all of the Brickercup and Brickubbles shippers out there. So, sit back, relax, and soak in that Buttercup x Brick x Bubbles love triangle goodness. 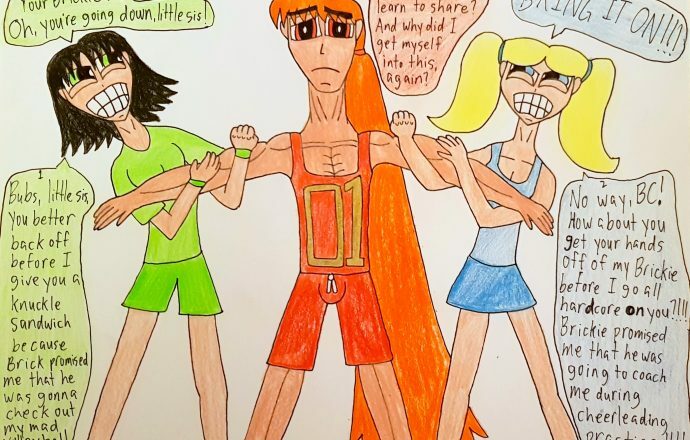 Ladies and gentlemen, Powerpuff Girls fans of all ages, welcome to the first piece of fan work centering on the likes of Brick and Blossom, which I call “It’s Not Easy Bein’ Red”, as it is a word play on the Kermit the Frog’s solo “It’s Not Easy Bein’ Green”. This Brick-centered episode of “It’s Not Easy Bein’ Red” takes place in Townsville High back in September 2009, when Brick, Buttercup, and Bubbles were in the eleventh grade. 17-year-old Brick Green may be the most popular, well-rounded, well-loved young man in school that girls would love to date and boys would be either green with envy, yearn to be his best friend, look up to him or even want to date him but it kind of comes at a price especially when he is in the middle of a cat-fight/tug-of-war challenge between 16-year-old Buttercup Utonium, who was the most athletic student and Volleyball MVP with a hard reputation, and her 15-year-old sister Bubbles Utonium, who was an extremely well-loved cheerleader for the Townsville Tigers as well as being heavily involved in the arts, music, and theater. As I said before, being Townsville High’s most popular male student may have its perks but it can get a little bit sticky when a love triangle such as this is involved. I definitely enjoyed making this come to fruition, as I can easily consider both Brickercup and Brickubbles far more exceptional than some other overrated RuffPuff pairing I know of that has been ubiquitous throughout the PPG fandom (*cough*Blossick*cough*). Moreover, I bet you already know who is my Brick-centered OTP and who is my Brick-centered cute, innocent pairing that works nicely as a BroTP or vice versa. Well, I hope you all enjoyed this piece of Brickercup vs Brickubbles fan art. Please let me know in the comments if you prefer Brickercup, Brickubbles or both and I will see you all next weekend for the second “It’s Not Easy Bein’ Red” installment. This time it will be a love triangle centering around Butch, Blossom, and Boomer and I am so freaking excited to make this happen. All right, everybody, take care and until the next time. 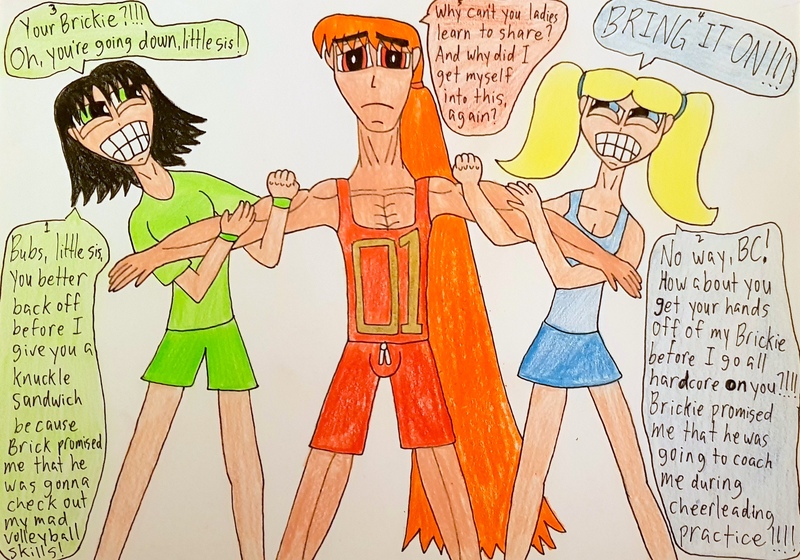 Buttercup, Brick, and Bubbles from The Powerpuff Girls belong to Craig McCracken and Cartoon Network.